My recommendation to you, is that every time you see a news story, with any identifiable quotes, you visit the website of the person (or organisation) that was quoted, and check the press releases on their media page. Some of my stuff ran in the USA by the way. I wonder if the dressing-up will have the effect hoped for here. Part of me would think it better for her to come on as a tough professional cop. If the charge is that her action was caused by a lack of expertise and experience, I don't spiffy dress as being the way to counter it. The charge doesn't have anything to do with what caused her to gun down an unarmed man sitting in his own apartment eating cereal and watching sports. The charge is that she did it. The prosecution doesn't have to explain why. That's the defense's job, trying to snow the jury into believing there was some rational explanation for what she did that somehow relieves her of culpability. I doubt that 'tough, highly trained professional' is the right tack to take if they want to do that. I suppose I put it badly, but I think that since there's no doubt in anyone's mind that she did the thing she did, there is little defense for it unless it can be shown that, in some way, it is the kind of thing an otherwise competent person might do. Of course things can be played in other ways, and juries are funny sometimes, so who knows. I would not have thought that justification for such an act is found in one's appearance, but I'm not on the jury. I suppose I put it badly, but I think that since there's no doubt in anyone's mind that she did the thing she did, there is little defense for it unless it can be shown that, in some way, it is the kind of thing an otherwise competent person might do. Of course things can be played in other ways, and juries are funny sometimes, so who knows. That's right. That's pretty much what I just said. I would not have thought that justification for such an act is found in one's appearance, but I'm not on the jury. Defense lawyers know that their client's appearance will have a huge effect on a jury, and do everything they can to control that. It probably shouldn't be that way. Research has shown that juries come to noticeably different conclusions when they are given transcripts of a trial rather than watching the same trial in person, but the system we have is what we have to work with, and lawyers on both sides of any trial are going to take every advantage of it. Of course. Even our "criminal justice system" has been monetized and overrun with money-based manipulations. The video shows an apparently distressed Guyger, still in her police uniform, talking on her phone as she paces back-and-forth outside Jean's apartment on Sept. 6. The neighbor who took it, who only wished to be identified by the name "Bunny," said in an interview published on Jan. 20 on YouTube by the Advise Media Network that she began recording about 60 seconds after hearing two gunshots and hearing a male voice saying, "Oh my God. Why did you do that?" The harassment began shortly after Bunny uploaded the video to social media, she said. "I did get a few threats from people saying they weren't gonna leave any witnesses behind, telling me I need to watch my back, things like that," she said. Trolls also found the name of the pharmaceutical company where Bunny worked and began harassing the company by phone, email and posting to its Facebook page, saying she was a "radical," "anti-police" and "a black extremist," she said. This is one of the two sisters mentioned as witnesses. Two sisters. Sometimes reported as living together and sometimes as living separate. Can't find their names or the location of their unit(s) other than near Jean. Several days after the incident, Attorney Merritt says they say they heard knocking, "Let me in", gunshots, and then "Oh my God why did you do that?" Police source (leak) says that they didn't give the same story to police right after the incident. I didn't know that one of these sisters was the video-taker of the scene with Guyger pacing and on the phone. Now we know that she lives on the floor below Jean. Seems odd to me. The video does not appear to be anything but neutral to me. It doesn't help or hurt either side. It's just a poor quality, but interesting, video of Guyger right after the incident. I'd like to see the technical procedure on how that occurs? What "credentials" are needed to work at a pharmacy? In Canada (besides the pharmacist)all you need is white coat and how do the "credentials" get officially "black listed" ... seems odd to me. agreed ... I'd say she looks very young .. like college kid in that video ... blonde people often are assume to be more innocent looking as well. ... plays loud music early in the morning so I walk into his apartment and shoot him. I've seen this scenario posted here a dozen times ... does ANYONE actually think this is what happened?? It's hard to believe that many people believe that, but clearly they do. I would guess that the prosecution's theory of the case will not have any such reason for the shooting, or any reason at all. The theory will be that Guyger's basic story is accurate, and that she's guilty of some degree of murder based upon that story. There will never be any evidence of any connection between Guyger and Jean, because there is no connection. Bunny (like Merritt) thinks that the killing was premeditated. They think that Guyger went to Jean's apartment for the purpose of killing him. She thinks that her video shows contradictions of what Guyger is known to have said about the incident. She sees that Guyger is pacing and talking on the phone instead of giving first aid, which is what she said she did. Bunny says that the phone call sounded personal rather than a call to 911. So Bunny is thinking, "Not giving first aid and not even calling 911. This woman wants that man to be dead. My video shows this." "It was just a lot of crying, a lot of hysterics," Bunny said. "She was just pacing back-and-forth for at least seven minutes, according to my video." Her video lasts for 7 minutes? I don't recall it being that long. I also don't remember her video showing the arrival of first responders - only when they leave with Jean on the gurney. Bunny says that she started filming Guyger only about 60 seconds after the gunshots. I wonder if Bunny actually started filming after the first reponders were already there and working on Jean inside the apartment. I don't know, what makes Bunny think she can tell the difference between a personal call and a 911 call in a situation like that? The caller is hysterical, it's not like they put on their "phone voice." When a person calls emergency services in the thick of something like this, I would expect many to be babbling and incoherent and definitely speaking informally. I have no position on what really happened here. Like most people I've talked to, I find the whole story simply bizarre. But somehow, the idea that the killing was premeditated (with THIS as the cover story?) seems even more farfetched to me than Guyger's explanation. It says she worked at a pharmaceutical company, not a pharmacy. Who knows what she did there. It seems weird to me, or at least she has a weird way of describing what her employer did to her. Bunny might be 100% correct about that being a personal phone call. Guyger may have already made the call to 911 and now she is on a call to a family member. 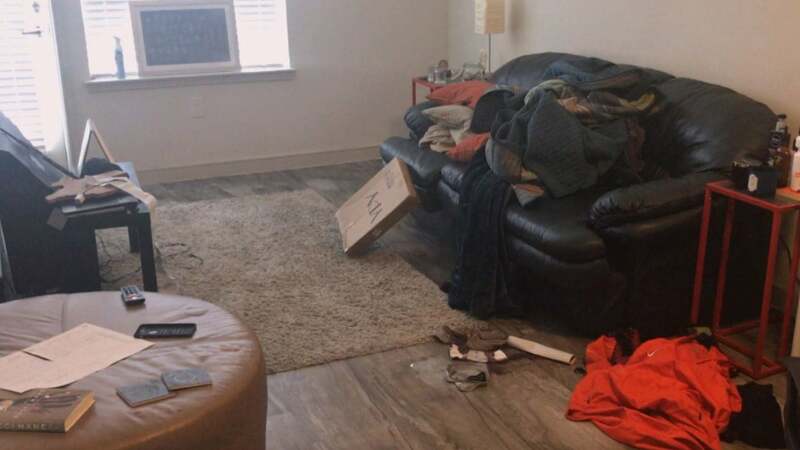 Guyger may have made multiple phone calls with the first one being to 911 while she is still inside the apartment. It sounds like Bunny might be playing for a GoFundMe page, or some lawsuit. Ah, yes. The completely logical conclusion (*no bias included). She does have a GoFundMe page to raise funds for herself where she has nearly met the $30,000 goal. She has also said that she is trying to get a book deal. And she started up a clothing brand on social media. She seems to be making a much bigger deal of this video that it is. She seems to think there is some grand conspiracy which she has had a major role in uncovering, which I don't think is the case. Her claims for the motivation for firing her as well as the claims of being blacklisted and denied some sort of certificate seem like unsubstantiated speculation at best. "Oh my god, why did you do that?" Could be from one of the first responders or a bystander. It could even have been Guyger talking to herself. Is the full 7 minute video available somewhere? The claim that she was filming Guyger 60 seconds after the shooting seems misleading or simply incorrect. Part of the video shows Guyger on the phone walking into the hallway and turning around back into the hallway. Just after that the video show a police officer entering the hallway from the left. It then cuts to another scene. That means police were on site at the time Guyger was filmed talking on the phone. We have previous reports that the police arrived 3-4 minutes after the 911 call. The police station is only about a block and half away, but some officers responded on foot and they could not get in the locked doors and had to bang on the doors to get residents to let them in. A 3 minute response time seems reasonable. Bunny may have started recording 60 seconds after the shots were fired, but the part of the video with Guyger talking on the phone would have to be about 3-4 minutes after the 911 call when police were on site. That would mean that the video does not directly contradict Guyger's claim that she rendered aid immediately after the 911 call. Last edited by DevilsAdvocate; 12th February 2019 at 12:10 AM. She said it was a man's voice. She says she heard it right after she heard the gunshots. Given the circumstances, it would be a reasonable thing for Jean to say. But it seems unlikely Bunny would have heard that. Merritt had said she was in her apartment. Jean would have had to yell that very loud for his voice to travel across his apartment, out the door, through the hall, down to the next floor, and into her apartment. Especially when nobody else has claimed to have heard that. No next door neighbors. Not even the neighbor that was right there in the hall leading to Jean's apartment. It kind of looks like Jean fell all the way back near the rear window of the apartment, assuming that the items on the floor are bloody and that's a blood stain on the floor. If that's the case, I did not realize Jean was that far back. Last edited by LTC8K6; 12th February 2019 at 12:29 AM. he may have moved to that spot after being shot. We don't know that he immediately fell and may very well have retreated from the armed invader of his apartment before dying of his wounds. The ottoman with the bowl of cereal is right there. There appears to be a TV there as well to the left. Plus we can see a bullet hole high in the wall right in line with that area. For now, I think Jean was back there when he was shot. Still looking for better pics, though. That may be why there are murder charges? If Jean was back there, he was no immediate threat to Guyger at all. Last edited by LTC8K6; 12th February 2019 at 07:49 AM. We did get a report about how far his body was away from the door. His body was found closer to the door than where this staining appears. Is this where you see the possible blood staining? Very minor point: pics of the place seem to show that Jean was not exactly a neat freak. That cereal bowl could have been from the morning. Does anyone else see a possible empty round on the ottoman? Last edited by LTC8K6; 12th February 2019 at 08:03 AM. Doesn't really look like the item, though. And the papers appear to be gone? But, I think I do remember the listing of the recovery of Guyger's empties. Two empty cartridges found just inside the doorway. From Dallas PD General Orders. 1. Traveling to and from work. 2. Appearing in court in an official capacity for the Dallas Police Department. 5. All uniformed officers will wear their ballistic vest while working off-duty jobs. that there is a threat to life or they have a reasonable fear for their own safety and/or the safety of others. death or serious bodily injury to the officer or another person. G. Officers will not fire warning shots. Now I'm wondering if they fired her, so she wouldn't have to answer to the reasonable alternatives restriction. Maybe they are helping her by firing her? There is no duty to retreat for a private citizen? caliber weapon. If armed, the officer must be currently qualified with that weapon as set forth in the General Orders. A. At any time when in a city vehicle. B. At any time when in uniform. C. When performing police related off-duty employment. is cause for corrective action. The following subsections constitute dereliction of duty. attention, regardless of the supervisor's or violator's assignment or rank within the Department. officers of this Department without undue delay and, in any event, before their tour of duty is ended. C. Failure to place evidence in its officially designated place for preservation and storage. E. Cowardice or failures to perform police duties because of danger. and shall be prepared to act to the extent possible any time circumstances indicate their services are required. unless in an off-duty employment capacity and with prior supervisory permission. 4.2 No employee shall be convicted of, nor commit, any act or omission which is defined as a criminal act. a tendency to adversely affect, lower or destroy public respect and confidence in the Department or officer. police incident to his discredit. relayed from a superior by an employee of same or lesser rank. at all times in their relationships with one another. supervisors to maintain discipline, or by a reckless disregard for the truth. or dentist or to take drugs in a manner not prescribed by a physician or dentist. 4.10 Officers shall not use any unnecessary or inappropriate force against any person. 4.11 No employee shall at any time ridicule, mock, deride, taunt, or belittle any person. 4.12 No employee shall willfully embarrass, humiliate, or shame any person. 4.13 No employee shall willfully harass any person nor take any action in a manner that might excite a person to violence. 4.15 No employee shall use indecent or profane language in the performance of official duties or in the presence of the public. when reporting for duty or to the extent their job performance is impaired. 5.16 Employees shall not be intoxicated while on duty. They shall not at any time, on or off-duty, be intoxicated in public view. 5.17 No employee in uniform shall purchase, possess, be under the influence of, or drink intoxicants while on or off-duty. Last edited by Drewbot; 12th February 2019 at 08:14 AM. It is the same object. Look at it during camera pan at 0:42 instead of as a still frame. Blue=reported location of two spent cartridges. Red=reported location of Jean's body. So maybe he is sitting back there eating cereal and watching TV. Guyger at the door causes him to put the cereal bowl down on the ottoman and go to see who's messing with his door. He makes it back to the spot near the sofa, probably trying to get to his cell phone. I guess that is plausible. Can I get list of all the ways I'm "allowed" to act when sitting alone in my own home that won't invite a wave of "Well that's odd... that's suspicious... well that just doesn't seem right to me..." when a cop walks in uninvited and shoots me dead for no reason? With what I believe to be blood, it just looked like Guyger might have shot Jean while he was considerably farther away from her. I had never noticed the blood before. I think you are seeing that where it doesn't exist.